Hot, cold, wet, dry, drought, blizzard, wind, rain, snow, sleet or ice…it’s all ‘global warming’ and it’s all your fault. Democrats refuse to listen to anyone who isn’t a professional climatologist about climate. This sounds like a sensible approach, until you realize who climatologists are. They are people whose living depends on pushing global warming alarmism. 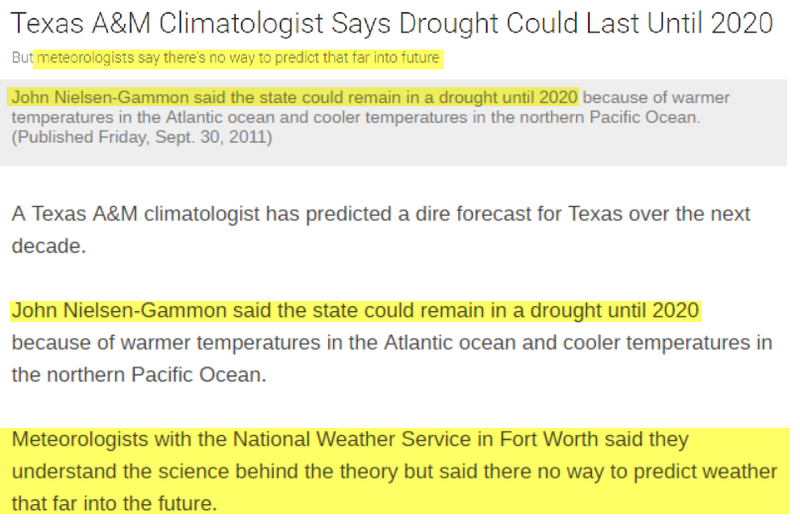 Consider the Texas State Climatologist who predicted Texas would remain in a drought until 2020. He had no idea what he was talking about, but it made the kind of story which attracts press attention, and brings money in. Meteorologists have known for over 40 years that climatologists are incompetent hacks. This goes back to the time when climatologists predicted that global cooling was going to kill us all. Climatology is a political tool of government. It has nothing to do with science. An absolute MUST SEE. Share it with all your friends and family. A very important and brilliant 5 minute senate testimony from the brilliant Alex Epstein. I saw this video the other day and decided to Post it here at our site. It’s worth watching for a number of reasons. Alex Epstein is the main speaker here, and he makes the moral case for our reliance on fossil fuel electrical power generation. Note also, at around the 7.20 mark, the California Democrat Senator, Barbara Boxer comes in to speak, and instead of actually asking a question, just proceeds to denigrate the Alex Epstein. Senator Boxer again comes in close to the end of the clip at around the 15.15 mark, and (referring back to what Alex Epstein correctly calls it, CO2, Senator Boxer again denigrates the speaker and refers to it as Carbon Pollution.